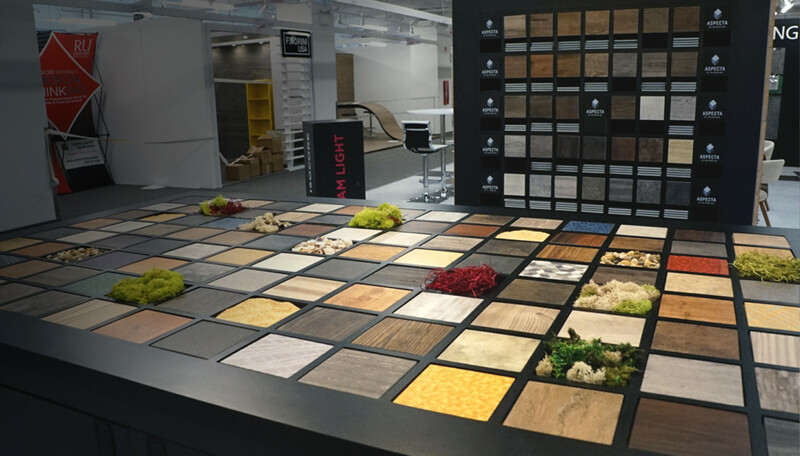 A longtime client, Metroflor, was looking to freshen up its trade show booth for Neocon. The company had decided to incorporate biophilic design by adding natural elements to its already modern branding. 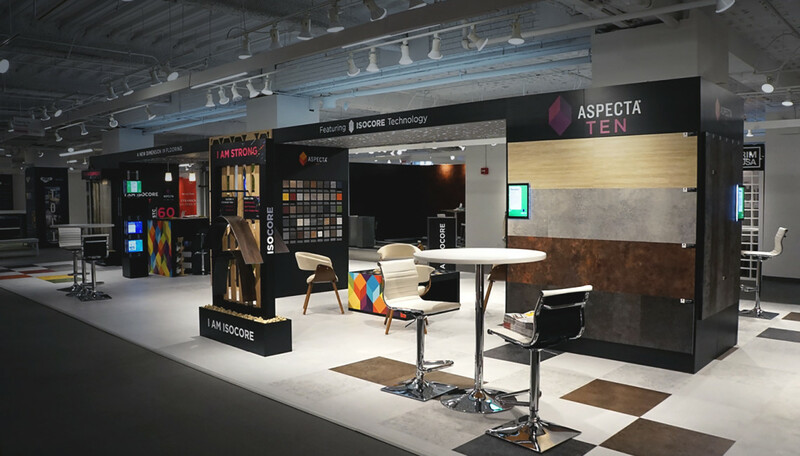 With over five years of working with Nimlok Chicago, the Metroflor staff put their full faith in the Nimlok design team bring to life their new trade show exhibit design in a cohesive and synergetic way. The existing design had a simple, black layout, but needed to communicate brand messaging in a modern way. LED signage was added throughout the space to provide sleek messaging. 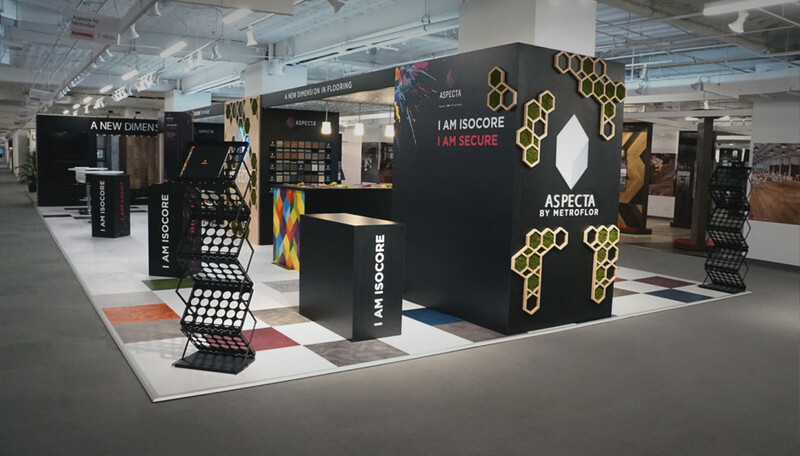 The exhibit featured a large, custom flooring sample table that housed flooring samples intermingled with grassy elements, such as moss and rocks, to reinforce the brand’s commitment to sustainability and biophilic design. Taking its inspiration from nature, a honeycomb lattice filled with moss embellished the walls of the exhibit. Two unique elements that were added to the exhibit were central to communicating the brand’s flooring capabilities. The first included three vertical aquarium-like displays with submerged flooring inside. 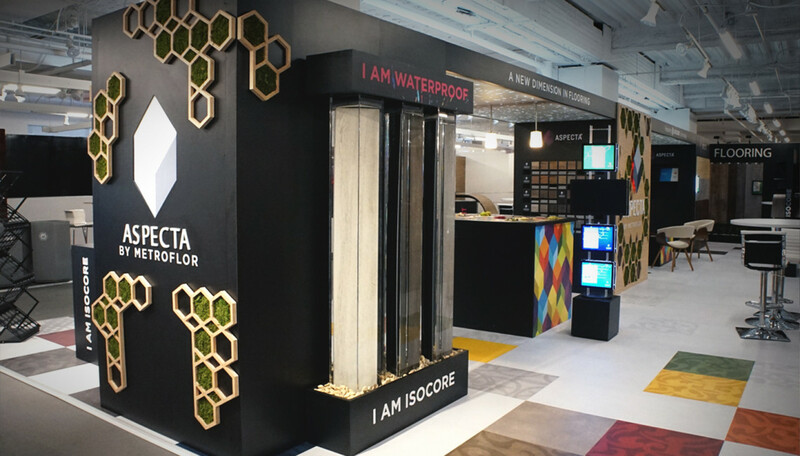 Each container held a different style of Metroflor’s waterproof flooring—not only effectively demonstrating the product’s capabilities, but also acting as a modern decorative element within the exhibit. The second design element was the sculpture-like flooring installation. The ‘Icocore’ flooring line is incredibly flexible, which was demonstrated with bent and twisted flooring pieces. This once again demonstrated brand’s products while acting as a modern, artistic piece.